Would you like to know how a duffle coat may look like? I don’t mean the exterior, I would like to show you how the duffle coat begins. 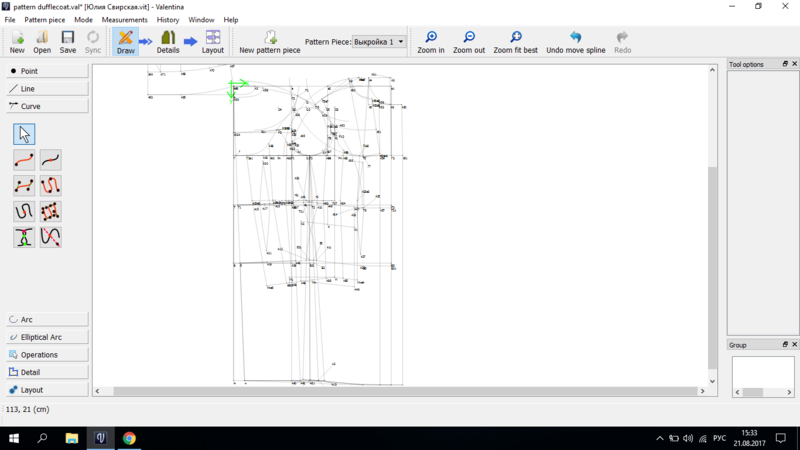 So, let me open my Valentina pattern file and show you. A bit messy, isn’t it? Actually this is just a basic pattern for outerwear and I can manipulate it at any way I want. What is good about Valentina, it’s that it took me very little time to create this wonderful pattern. To be honest, I’ve spent much more time writing this post than drawing it. This entry was posted in Uncategorized and tagged bespoke tailoring, pattern pieces, patternmaking, Valentina on August 22, 2017 by svirskaya84. This entry was posted in Uncategorized on June 5, 2017 by valadmin17. Want to learn patternmaking? Use Valentina! 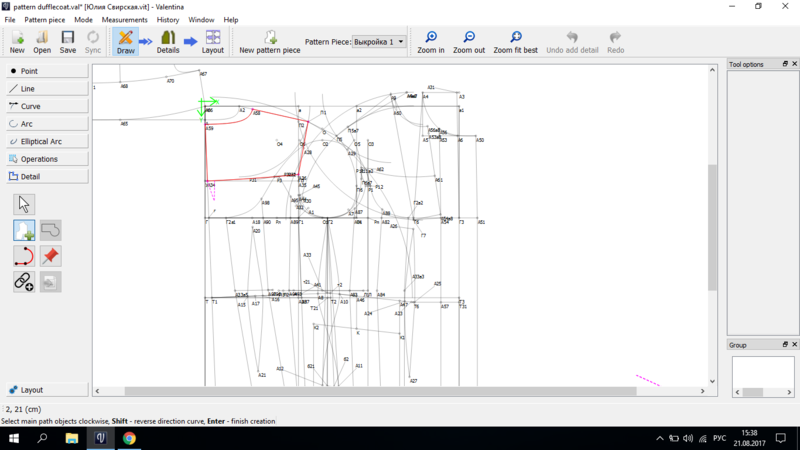 So… you want to learn patternmaking. What will you need to get started? First, you’ll need a pattern making book. Most of them use the traditional formula plus measurements method to make patterns. Many of these books can be found on Ebay or Etsy. To manually create the patterns from your book, you will need a large t-square, a roll of kraft paper, pencils, erasers, a large protractor, various large and small French curves, and room to draw large patterns. You’ll probably need a calculator. Realistically, you’ll use lots of paper and erasers while you’re learning to make your patterns. 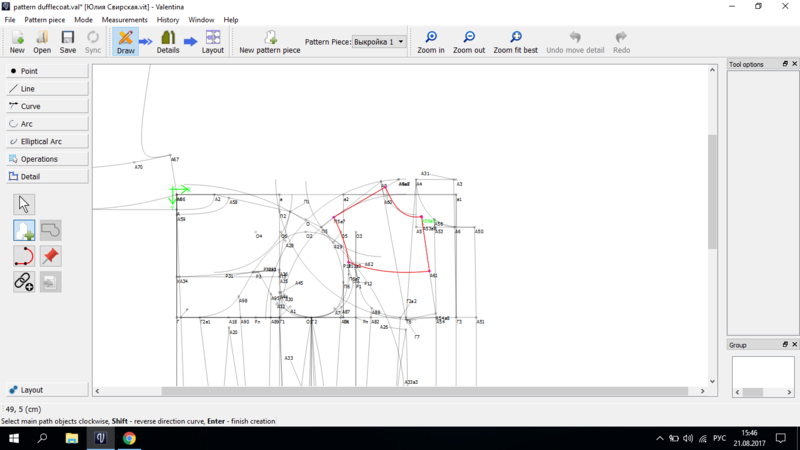 Or… You could use patternmaking software, which is usually based on CAD methods. Some are expensive, some are very expensive. They might be difficult for a newbie to use because they don’t implement the techniques as taught in patternmaking books. 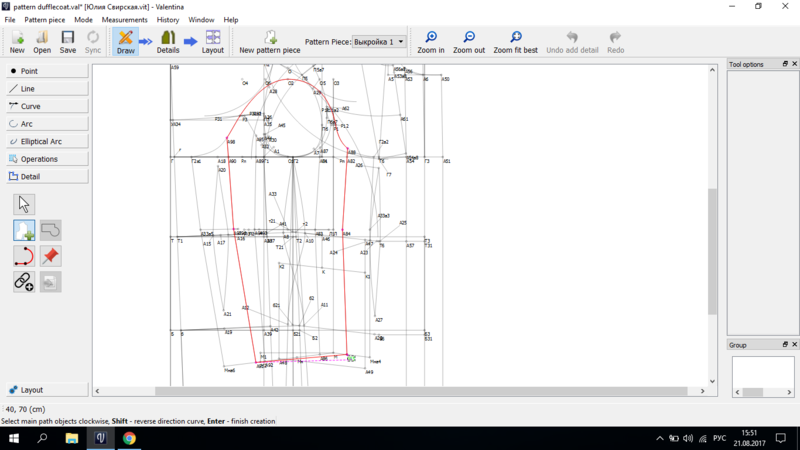 Also, with some patternmaking software you can’t sell the patterns you create so you’ll need to know the licensing of the software package to determine what you can do with it. Or… You could use radical new design software, Seamly2D. It is free and open source and there are no licensing issues – you own your own work and can use your patterns as you choose. It isn’t typical CAD software – Seamly2D uses parametric design principles to create patterns using body measurements as inputs. Parametric design is gaining popularity with architects and other engineers and designers of complex products. Seamly2D’s patterns automatically re-size whenever you select a new measurement file. You create the measurement files with measurements from yourself, friends, clients, or you can create tables using industry size data. You then create pattern designs with formulas and measurements. In Seamly2D, you begin a pattern design in Draw mode. You are given an initial pattern piece with a first point ‘A’. Each point afterwards is generated with a formula. 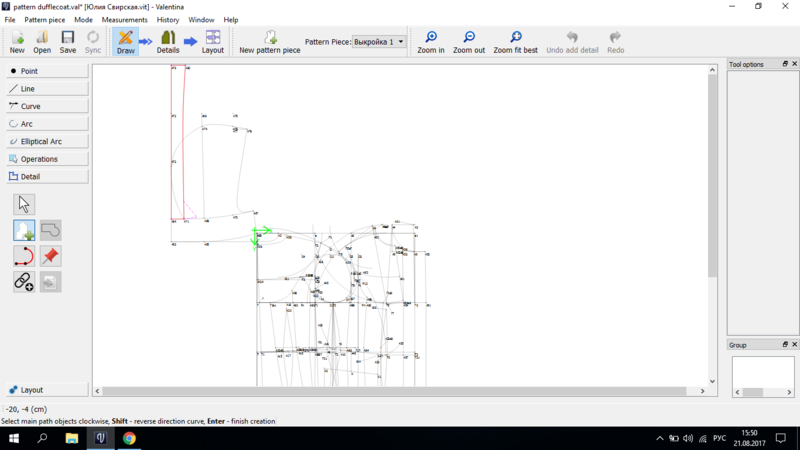 You can create lines, curves, and arcs from the points. You have access to the data (length, angle, etc.) from your previous points, lines, curves, and arcs to include in your formulas for the next point, line, curve, or arc. You can mirror, group, and rotate points, lines, curves, and arcs. You can create multiple pattern pieces. When you add seam allowances you can move into Detail mode, where you view the pattern pieces as they will be printed. In Detail mode there are tools for joining pattern pieces and generating an image (or Layout) of the pattern pieces you’ve selected to print. In Layout mode, you inspect a temporary ‘final’ image arranged on your selection of paper from 8.5″x 11″ sheets up to 44″ wide roll paper. You save and export the Layout to PDF, SVG, or other file format for printing. You can even export a large Layout as a tiled PDF for printing on your desktop printer. You can download Seamly2D free and open source software from http://valentina-project.org. It runs on Linux, Windows, and Mac OSX. If you have questions, post them to the forum at http://forum.valentina-project.org. The community is very active, and is welcoming to new and experienced patternmakers. This entry was posted in Uncategorized on January 26, 2017 by Susan Spencer.